CrossTown Fitness makes a splash for its 6th summer teaming up with Chicago SUP, the city’s elite Stand-Up Paddle Boarding company. Summer fitness-goers can head to North Avenue Beach to enhance their total body workout right under the Chicago summer sun. This year, CTF’s Community Director Stephanie Rountree will lead an hour and a half intense conditioning workout focusing on speed, agility and power. The Total Body Beach Training will kickoff the morning with a 45-minute high intensity interval-training workout on the sand followed by 45-minutes of endurance, stamina, strength and balance during Stand-Up Paddle Boarding on Lake Michigan. Every Saturday 7:45 a.m.-8:30 a.m.
All fitness levels are invited to take part in strength training and cardio routines on the sand. Each drill is scalable and incorporates just the right amount of cardiovascular endurance, stamina, strength and flexibility. Every Saturday 8:30 a.m.-9:15 a.m.
Attendees will paddle with a single bladed paddle while standing on oversized surfboards. SUP heightens balance, leg strength, coordination and stability all while taking in the breathtaking Chicago skyline. 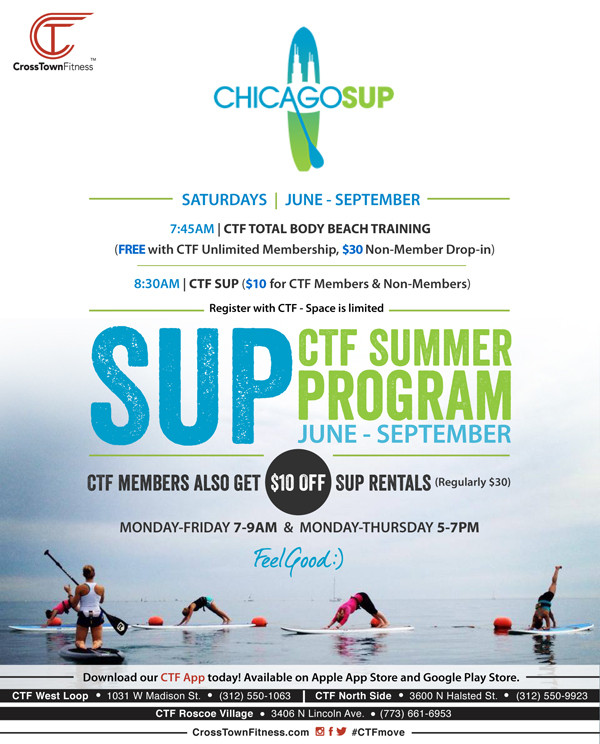 CTF Members will also have access to discounted rentals Monday through Friday from 6 to 8 a.m. and 6 to 8 p.m.
CTF Total Body Beach Training classes will be every Saturday beginning June 8 through September 28. Chicago SUP hut is located south of Castaways Bar and Grill on North Avenue Beach. Classes are weather permitting.